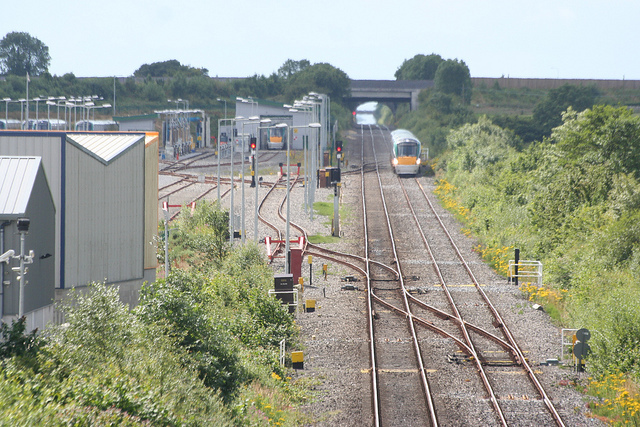 Last month I had a guided tour of Laois Traincare Depot. I was like a pig in pig stuff. For whatever reason, trains have always been important to me. Playtime at Langwathby school in the 1950s was always more exciting when Glasgow and Edinburgh expresses sped past, spitting steam and sparks. And in the 1960s I gazed longingly from home as the Thames-Clyde went by: ‘take me away, anywhere’ I pleaded! And now that I am away, the railways over Shap and Mallerstang are still dear to my heart. In my travels on Irish Rail, including the time I missed my stop in soporific stupor, I’m impressed by the rolling stock, the punctuality and the cleanliness. Well done, Irish Rail! Over the cold winter months, spare a thought for the staff. Let’s hope they don’t get too much of the wrong sort of snow—speaking of which, I saw how, because the hooter is mounted low on the chassis, it’s prone to being blocked with snow. I wonder, can you guess the way they deal with this problem? Well, girls and boys, the high-spec technological solution is to cover the hooter with pair of tights. Yes, that’s right, ladies’ nylon stockings. Hosiery. I saw it with my own eyes. I now dream about rail staff going shopping: ‘I’d like a pair of tights for my horn, please’.